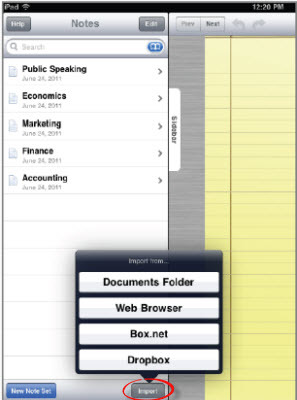 You can import PDF and PowerPoint files from the web browser, from the PaperPort Notes Documents Folder, and from Dropbox or your Box.net account. Import as New Note Set:At the bottom of the note set list, click the Import button. Choose the location from where you would like to import your document. Import Into Existing Document:On the page that you would like the include the document, click the Insert button. Choose File from Box.net, File from Dropbox, or File from Docs Folder, according to where your document is located.